Al Pease took part in three Canadian Grand Prix between 1967 and 1969. 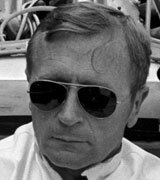 He didn't finish any of them and holds the very dubious distinction of being the only driver ever to be disqualified from a grand prix for being too slow at the 1969 event. After his F1 foray he raced Formula 5000 and Formula A cars with some success and was a key player in Canadian motorsport. He remained a classic car enthusiast in his later life.